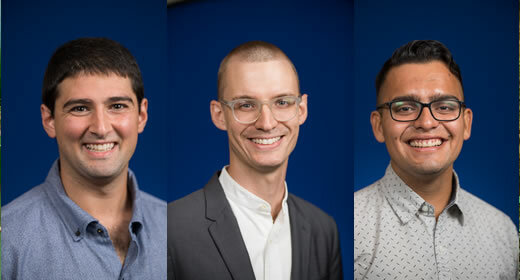 Three Ford School graduate students – Eric Hanss, Jonatan Martinez, and Nick Najor – have recently been selected to serve the City of Detroit Mayor’s Office as the 2019 David Bohnett Leadership and Public Service Fellows. In addition to completing their service assignments during the summer of 2019, Bohnett Fellows also have the opportunity to attend the annual United States Conference of Mayors in Washington D.C. Since the launch of the fellowship in 2010, Bohnett Fellows have served integral roles in Detroit’s public service projects including, but not limited to, infrastructure projects, social justice initiatives, bolstering small business development, and community outreach. We anticipate that our 2019 fellows will contribute greatly and serve vital roles in several of next summer’s projects. We would like to extend our heartfelt thanks to University of Michigan alumnus, David Bohnett (MBA ’80), who established the fellowship, as well as our genuine appreciation to the Detroit administrators who will work with our fellows next year. A graduate of Michigan State University, Nick Najor departed East Lansing in 2014 with a Bachelor of Science in Urban & Regional Planning. In the years since, he served as both an AmeriCorps member with City Year Detroit and as a Challenge Detroit fellow with DTE Energy. He has also worked at the Detroit Land Bank Authority as a project manager for the Rehabbed & Ready program. Nick enjoys pick-up basketball and is passionate about a wide range of policy topics, including local skilled trades’ workforce development. Eric Hanss is a transportation planner and policy maker focused on equitable investments in transportation networks and the built environment that promote community- and individual-level prosperity. Prior to graduate studies at the Ford School, he served as an embedded consultant within the Chicago Department of Transportation, delivering policies and projects to meet citywide performance targets to eliminate fatalities from traffic crashes, reduce dependency on private vehicles, and improve health .outcomes in communities of need. Eric is service-driven and committed to work in local government, having witnessed first-hand how cities drive policy innovation. Beyond urban transportation planning, Eric’s policy interest areas include poverty and inequality, public management, and open government. Jonatan Martinez, a Detroit native, has been working as a program manager at Wayne State University's Center for Urban Studies for the past three years. His work has focused on developing and implementing programs that work on the mitigation of lead poisoning and asthma within Detroit. He is also involved in environmental justice efforts as a Clean Air Council fellow and intern at the Michigan Environmental Justice Coalition. Jonatan attended Michigan State University, where he received a Bachelor’s degree in Zoology. Prior to his time at Wayne State, his work focused on the evolution of spatial cognition and cognitive genomics within Michigan State's Department of Integrative Biology. In his spare time, Jonatan enjoys biking, hiking, and dancing. David Bohnett is a University of Michigan alumnus (MBA '80) and entrepreneur. The foundation that bears his name is committed to improving society through social activism.